If you want to uninstall, execute the uninstall-miredo.command script, located in the /Applications/Utilities folder. This release will work fine with MacOS X 10.4 (Tiger) and MacOS X 10.5 (Leopard). It will also work with MacOS X 10.6 (SnowLeopard) as long as you are using the 32-bit kernel (very few people are using the 64-bit kernel at the moment, chances are you are using the 32-bit kernel). You will need to reinstall miredo-osx after upgrading to SnowLeopard. Do not try to install this package on any earlier version of MacOS X! A subversion repository is available here. The latest "stable" tag is probably what you want. UPDATE: I've moved the miredo-osx repository over to Github. Special thanks to Mattias Nissler for his work on the MacOS X TUN/TAP Driver, which is included in this package and used by miredo. However, teredo will not work behind a symmetric type of NAT. In that case your only option is setting up some sort of manual tunnel. 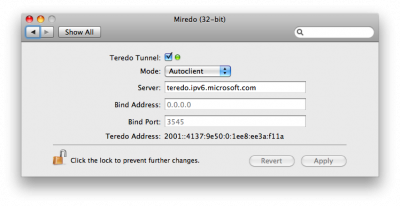 In Windows Vista, the Teredo component is enabled but inactive by default. In order to become active, a user must either install an application that needs to use Teredo, or configure advanced Windows Firewall filter settings to allow edge traversal.